There’s been a lot of talk about comic book movie fatigue these days, but the people at Marvel Studios clearly aren’t letting that affect their productivity, because just like fellow Disney-owned company Pixar, they’ve continued to deliver the same high-quality films as when they started. Granted, it’s only a matter of time before Marvel’s unblemished track record is ruined by a “Cars 2,” but “Captain America: The Winter Soldier” is not that movie. In fact, it’s a major improvement upon the character’s first solo adventure, trading in the period war setting for an old-school conspiracy thriller that addresses real-world issues like national security. It also has some really cool action beats, occasional bits of humor, and perhaps most importantly, a better storyline for its titular hero. 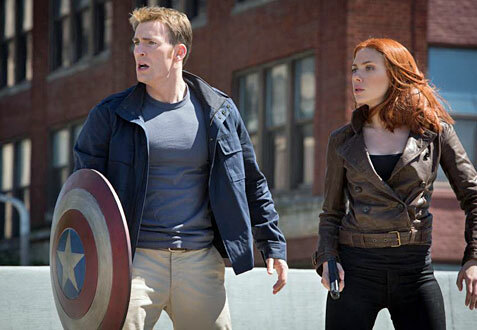 Since being thawed from his icy slumber and aiding in the defense of New York in “The Avengers,” Steve Rogers (Chris Evans) has become a full-fledged member of S.H.I.E.L.D, but he’s still learning to adapt to the modern world and the questionable methods that Nick Fury (Samuel L. Jackson) employs to ensure that it remains safe. When S.H.I.E.L.D. 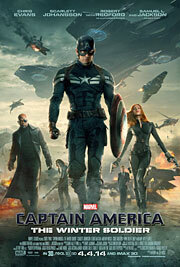 becomes compromised by people within the organization, however, Steve is forced to go on the run alongside fellow operative Natasha Romanoff, aka Black Widow (Scarlett Johansson), in order to smoke out the traitors and stop them from assuming control of a secret fleet of aircraft carriers designed to eliminate threats before they happen. Standing in their way is a super-powered, metal-armed assassin called the Winter Soldier who looks suspiciously like someone from Steve’s past. There are a number of reasons why “The Winter Soldier” is a superior film to its predecessor, and topping that list is the more interesting character arc that’s been given to Steve Rogers/Captain America this time around. The whole conspiracy plot not only creates a sense of foreboding and suspense, but it lends itself to the moral battle that’s been waging inside Rogers since he first began to distrust S.H.I.E.L.D. in “The Avengers.” That distrust allows Evans to play the character with a lot more complexity than the typical goody two-shoes Boy Scout from the comics, which in turn gives him more to build on for future stories. The decision to team up Rogers with Johansson’s Black Widow was also very smart on the part of returning screenwriters Christopher Markus and Stephen McFeely, because although the characters couldn’t be more different on paper, they complement each other really well. Additionally, the two actors have such an excellent and effortless chemistry that it only makes the partnership even more effective, with Johansson given just as many moments to shine as her co-star. In fact, “The Winter Soldier” is every bit a S.H.I.E.L.D. movie as it is a Captain America movie, with Samuel L. Jackson’s Nick Fury, Cobie Smulder’s Maria Hill and newcomer Anthony Mackie’s Sam Wilson, aka The Falcon, all playing an important part in the story. Mackie doesn’t get much to do until the final act, but it’s a fun debut for the fan favorite character that opens the door for other appearances down the road, while Jackson gets one of the film’s best action sequences. There are a few other familiar faces that pop up as well, but they won’t be ruined here, especially when it’s hard enough discussing some of the major characters without getting into spoiler territory. But because that’s impossible to avoid in regards to Sebastian Stan, it’s worth noting that although he has less to do from an acting standpoint in this film, his transformation from Bucky Barnes into the Winter Soldier provides Captain America with a more formidable adversary that, just like Mackie’s Falcon, could become an essential piece in Marvel’s future plans.